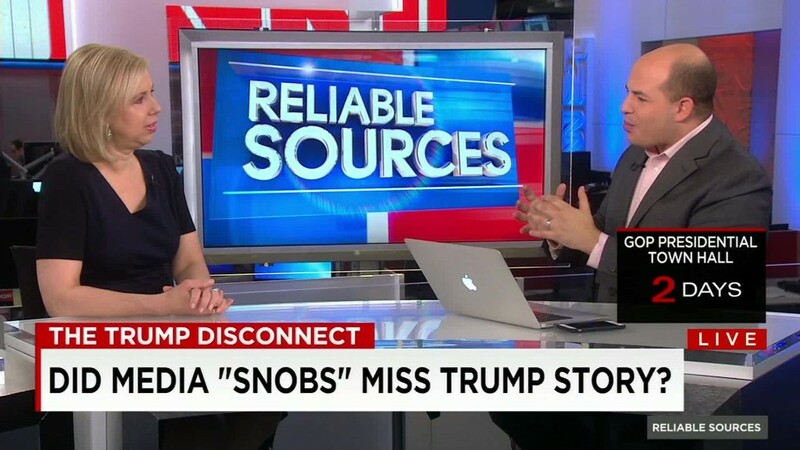 Trump phenomenon was "missed by everyone"
Sunday's edition of "Reliable Sources" was devoted to "The Disconnect," the massive split between what the media thought of Donald Trump's campaign and what he meant to his supporters. There's been some incisive, impressive coverage of the Trump phenomenon. But more than a few reporters and commentators have regrets, so this is a moment for self-reflection. New York Times columnist David Brooks recently wrote that media elites "did not listen carefully enough." And Time magazine editor Nancy Gibbs told me on today's program: "I think seldom have so many people been so wrong so consistently about so much." Panelists on the program attributed the "disconnect" to several factors, including an over-reliance on establishment Beltway sources; predictive, data-driven journalism; a failure to report the views of average American voters; and an "Acela corridor bias." Before the program, and again during the broadcast, I asked for viewer feedback via email, Facebook and Twitter. Here are a selection of the responses. "I don't think that it's that the press got anything wrong about Trump. It's what you got wrong about the American people." "The clubby, larded media machine just couldn't see their toes around their stomachs... At first, Trump was a joke, a flash in the pan. Pundits predicted he would disappear. Then, he became a loutish jerk chewing the scenery. Trump supporters were dismissed. No one took the time to understand what they were saying." "We need a more decentralized media apparatus that includes includes journalists from major publications based outside-the-Beltway with a national, not regional, focus." "He scares me to death, but I get him because I am frightened over my future. He strikes a nerve that most journalists do not understand." "The MSM missed the attraction of Trump because they are part of the Democrat propaganda machine. They're insulated in their Liberal NYC Towers and have no clue what the regular folk out in the country feel." "What seemed to happen here is that journalists immediately laughed off the idea of a Trump candidacy (much less presidency) because that's what their environment confirmed. And I don't mean 'those elitist east-coast journalists.' I mean that the type of Republicans journalists regularly encounter weren't Trump supporters. The reference group was overly establishment." "Trump speaks to us in a straightforward way. We are tired of being lied to." "In the movie 'Spotlight,' experienced editors and journalists missed the story for years out of deference to a mighty institution, the Catholic Church. I see a similarity here -- the real Trump story was missed because 'the media' in general is too focused on ratings and not on the real responsibilities of journalism -- to investigate and hold accountable." "Why was Trump not taken seriously? It is simple: Who, in their right mind, would have imagined such a vulgar, self-absorbed individual who repeats everything twice, flaunts their own abuse of the system, and is so filled with hate could become the leader of this great country?" 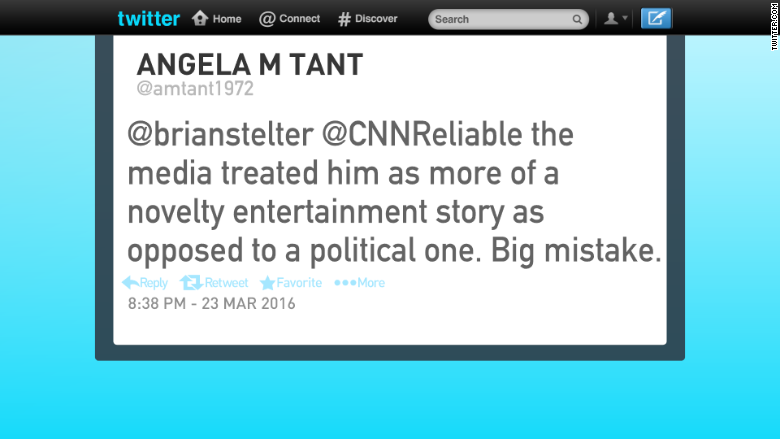 "I think so many commentators and columnists missed the relevance of his campaign because of their own arrogance... I only wish I had stock in hand lotion for all of the hand-wringing that is going on."